I love Indian food. It's my favourite fast food to go in New Zealand. Butter chicken, chicken tikka massala with rice or naan and mango lassi are regular favourites, often with vegetarian options too, especially if eating on site at the restaurant. Plus vege pakoras if I'm feeling extra hungry. My Indian love started in high school after that unforgettable day Dad and I were feeling adventurous one school day he took me out for lunch on (I can't remember the occasion). We suffered greatly the following day, causing Dad to be put off Indian pretty much forever, but I braved it to face it another time, and have not looked back since. I have fond memories with Indian food. It was our favourite after school food during the last year of high school. Indian is still a popular choice for our reunion get togethers, which has been a bit overdue for some time now. During my uni days, I would often have kids size meals at the local food court. Truth be told, I was scared to try Indian food while in France. I didn't want to be disappointed by the French style Indian cuisine the way I had been by their Japanese. I ended up having some in Toulouse, though, and it was thankfully not too bad. 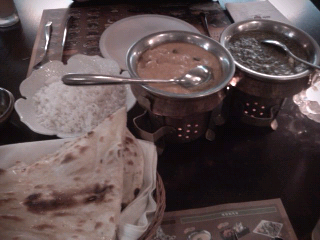 This restaurant near my place, in Ilsan, is my first Indian place in Korea. I had heard good things about it before going, so I had my hopes up. The restaurant is big, and even on a Tuesday night it was pretty filled up with friends and couples. As we walked through the silky curtained entrance, we were greeted by Indian servers who were very fluent in Korean. The garlic naan was wonderful, as were the chicken and vege curries. The mango lassi could have been better, they weren't mango yellowy enough. However, I was very satisfied with my filling dinner, and would very much recommend the place for its decor, cleanness, and friendly service, as well as the food quality. This is especially so after the very average lunch I had at Idae this afternoon, which was a disappointment. The curry only had three pieces of chicken. Unacceptable. Apparently there are better Indian places near Seoul National University of Education and Shinchon, so perhaps will try those when the opportunity arises.